On looking at NOAA’s sea surface temperature anomaly in the North Atlantic tonight there seems to be a lot of orange (warmer than usual) off the coast of Ireland across the pond to the US. A lot of energy therefore has to be displaced before we can start thinking about any sustained cold weather – and is a big part of the reason why the Atlantic has kicked back into life. 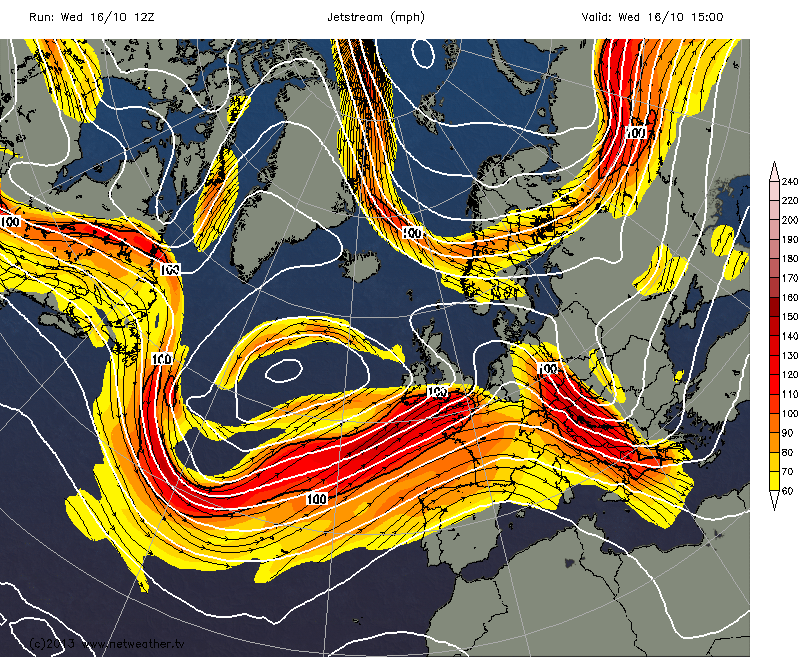 Expect a succession of depressions, driven along by a brisk jet stream (currently right over us blowing at over 100knts) to whistle across us in the next 10 to 14 days bringing very mild temperatures together with a mix of rain, blustery winds and sunshine. Any HP ridges will probably be short-lived – though equally any rainfall should be average. In these situations most of the rain falls over western parts of the British Isles.